Winter Hugs Candle – Coyer Candle Co.
I’m a desert dweller. We don’t have snow, we don’t really have winter. We’re a little bit wimpy down here when it comes to inclement weather. When the thermometer hits 68 degrees, we break out the parkas. 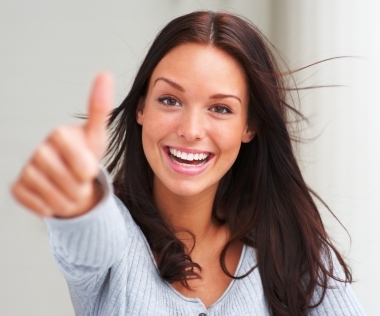 If it rains, businesses close (okay, so not really, but they should…desert dwellers cannot drive in rain!). Yes, we have to fake winter. 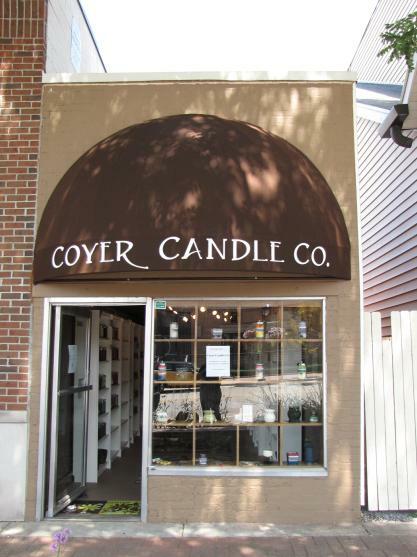 What better way to fake winter than to burn a nice wintery fragrance by Coyer Candles appropriately entitled “Winter Hugs”!Coyer Candle Co is a family owned business based out of Midland, Michigan. They specialize in 100% soy candles with a very unique look. They have an actual storefront in Midland as well as an online retail store. 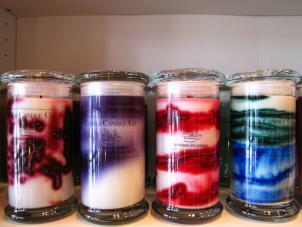 Offering several different types of candles including, 8 oz. square mason jars, 21 oz. Libbey status jars, and 12 oz. 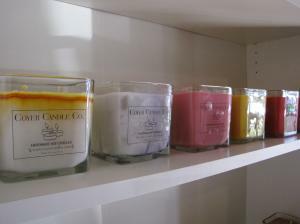 wood wick candles; Coyer has a nice selection of products to choose from. If you’re a complete scent junkie (and if you’re reading this, I’ll assume you are), Coyer offers room sprays and aroma bead air fresheners as well. Coyer did a nice job on their website. The colors are eye pleasing and the candle photos are simply gorgeous. It was easy to navigate and offered a nice variety of fragrances and a detailed scent list (a huge must for me!). My only complaint was with the online store page where you can purchase their candles online. If you don’t scroll down on their inner scroll bar next to the pictures in the store, it looks like you’re at the bottom of the page and you don’t see all the products hidden below. I love the Libbey Status jars, but when I went to the online store link, it looked like they weren’t available, until I figured out I had to use their inner scroll bar and not my scroll bar on the right hand side. What did my candle from Coyer Candle Co look like? I’ll admit, when it comes to looks, I’m not always a soy fan *gasp*. I’m a color junkie. I like a candle that is bright and pretty, clean looking. When it comes to soy, I’ve gotten used to pale pastel, Easter egg colored candles. This is what I expected as I waited for my box to arrive. I was pleasantly surprised! Enough so that I had to go and re-read the website to be sure this was soy! This was one gorgeous candle. The Winter Hug fragrance was comfortably tucked in an eye pleasing blend of soft blue and cloud white wax with gentle swirls of deep cobalt delicately marbled throughout. The expertly blended colors were phenomenal, and thoroughly impressed this color craving candle connoisseur (say that ten times fast)! The 21 oz. Libbey glass status jar with silver lid was very elegant and complemented the sophisticated look of the wax nicely. The front label was clear with black font and went well with the higher end, upscale look the candle projected. Well done Coyer, this is a candle that looks fabulous! So what did this stunner smell like? What did my Winter Hugs candle smell like? I’d have to say that their description was dead on. 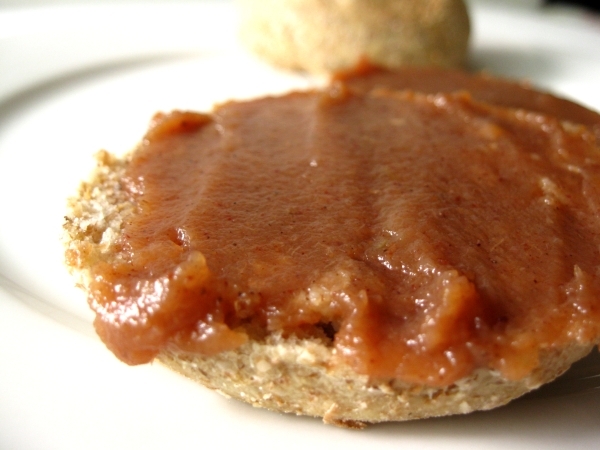 This was a mouthwatering, grab-a-blankey-and-curl up-with-a-big-fat-apple butter-slathered-piece-of-toast fragrance! It’s definitely a cold weather comfort scent. The cold throw was fantastic and the hot throw did not disappoint. I kept sniffing the jar repeatedly; I might have drooled a little. I have burned many a candle in my day (and I do mean MANY!). I can honestly say that this was one of my all-time favorite scents. It is absolutely delectable. Think crock pot filled with sweet baked apples whipped into a fluffy frenzy with dashes of spicy cinnamon and comforting cloves. Top notes were definitely more spice, but the apple peeked through halfway into burning and brought out warm buttery notes. I can see why they added, “hugs” in the name. This was like a big comforting buttery, apple-y embrace. We don’t have much winter here in the desert, but dang, if this is what “Winter Hugs” are like…I’m so moving to a colder climate! The candle performed nicely and only needed to be disciplined once (wick was a little bit big for the scent, but with good trimming, I was able to tame down the flame and get a decent throw). I had a nice clean, slow, cool burn with no excess wax. The flame flickered softly (which is typical with deeper jars), and really added to the candle’s elegant appeal. Yum. Buy it!Okay, kidding, sort of. I really enjoyed the stunning ambiance of the blue swirled candle and the fragrance was absolutely drool worthy (that’s an adjective, right?). It wasn’t the strongest candle I’ve ever burned, but it filled my medium sized office nicely and the fragrance lingered slightly after it was blown out. I can tell you this, when it hits 70 degrees in February and I need a little dose of winter, I would absolutely trust Coyer Candles to give me my winter fix!Happy candle smelling!! Have you tried Winter Hugs from Coyer Candle Co? Rate it with us… simply register, post your comment below and star rate this candle. It’s easy! Winter Hugs Scented Candle scent description: Warm apple butter with spice notes. 70 in the winter?! so jealous. it's been in the 40's here in PA and it feels heavenly. it's made me wish we were somewhere warmer. and the thought of not being able to drive in the rain is really funny to me too :p very cool review -- also awesome that you desert dwellers still burn winter candles even though it's not snowy where you live. i'm not sure i could get down with those groovy colors as i just prefer white/cream wax but the scent sounds amazing.